June 25, 2012, 2:59 p.m. This summer the Boston Globe’s online sibling will start an alternative music channel with vets from indie station WFNX. By Justin Ellis @JustinNXT June 25, 2012, 2:59 p.m.
Boston.com sees a future in radio. On Monday Boston.com announced plans to launch an alternative music station that would livestream from the Boston Globe’s headquarters. The kicker? They’re bringing on some of the dispatched talent from Boston’s WFNX-FM, the formidable independent rock station recently purchased by ClearChannel. The to-be-named station would function in many ways like WFNX, with music, interviews and events based around the city. But instead of beaming out over the air, the channel would be exclusively available through Boston.com and mobile apps. The station will go live on Boston.com later this summer. Since last year’s split with BostonGlobe.com, Boston.com has methodically launched one new project after another, including event ticketing, sentiment analysis tools and a sports TV show. Just recently it applied to get into the domain-name managing business. It’s clear the web-native sibling to the Globe wants to stretch its arms out wide to find new revenue streams as well as new methods of building audiences. The technology is on their side here; it’s not that difficult to set up a streaming radio station. The problem comes in building an audience and making the station profitable. The Globe sees the infusion of WFNX personalities as way to help. DJs Julie Kramer, Henry Santoro and Adam 12 are joining the Boston.com staff along with former WFNX program director Paul Driscoll and the station’s leads on ad sales and promotions. All of the new Boston.com radio team were among those laid-off by ClearChannel in the WFNX purchase. “All of a sudden we realized this wealth of talent was suddenly available and we mobilized to launch Boston.com radio,” said Lisa DeSisto, general manager of Boston.com. DeSisto told me “Boston.com radio” is a working title at the moment. She said music programming has been an idea they wanted to pursue in the past, but couldn’t figure out the right format. A streaming radio station makes sense because it would allow Boston.com to take advantage of what they already have: a technical staff, established community connections, and an existing ad sales staff. They’re not yet releasing technical details about the station, but Jeff Moriarty, vice president for digital products at the Globe, told me they will have iPhone, Android and BlackBerry apps. Moriarty said they want to provide visitors to Boston.com or mobile users updated program and song information to make the station more accessible throughout the day. One of the biggest benefits to setting up a streaming radio station is the setup costs are significantly lower than over-the-air. The costs are even lower if you can use existing parts of your business, which Boston.com plans to do. “It’s like starting up a newspaper now. You don’t need a printing press anymore, all you need is some technology to get up and running,” said Moriarty. The barrier to entry, for Boston.com, is relatively low compared to the revenue potential. Still, it’s more money Boston.com is spending trying to build a new, stable revenue base. I asked DeSisto if they saw risks in spending out front of so many new projects. She told me the company is following its business plan and believes things like Boston.com radio will offer incalculable, intangible benefits. DeSisto told me they have high expectations for advertising through the radio station. 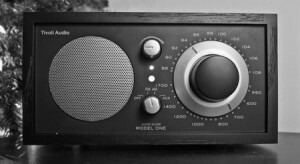 Boston.com radio would be an outlet for existing advertisers with Boston.com and the Globe, but would also position the company to reach radio-specific advertisers. There still are some things that will be new for Boston.com, which, again, is where the former WFNX-ers will come in handy. They’ll need a programming schedule, a studio and a mechanism for paying royalties on songs. Where the ex-WFNX staff may be most needed is using their prior experience to help draw an audience to the new station. A streaming radio station seems like a good bet on a future where mobile devices, tablets and internet enabled-cars provide endless outlets for news and entertainment to consumers. But we’re still in the present, and streaming stations don’t occupy the space on the radio dial that can drive large audiences and build identity. Plus, if you’re in the online radio business you’re not just competing with the old-school stations, but also the Pandoras and Spotifys of the world. But Boston.com has a good market position to grow, having been online since 1995. They’re hoping that springboard, along with apps, events and a veteran radio staff that knows the territory, can give the station the launch it needs. “Without a terrestrial signal we want as many avenues available to get it out there,” Moriarty said. POSTED June 25, 2012, 2:59 p.m.
Ellis, Justin. "Where rock lives: Boston.com gets into streaming radio." Nieman Journalism Lab. Nieman Foundation for Journalism at Harvard, 25 Jun. 2012. Web. 24 Apr. 2019. Ellis, Justin. "Where rock lives: Boston.com gets into streaming radio." Nieman Journalism Lab. Last modified June 25, 2012. Accessed April 24, 2019. https://www.niemanlab.org/2012/06/where-rock-lives-boston-com-gets-into-streaming-radio/.